If you happen to be in Las Vegas on July 6th, swing by the Get Up Gallery (520 Freemont Street) to catch the opening of LV SK8 Six, a show of custom painted skateboards. Well, I suppose we’ll have to use the word “painted” somewhat loosely. Participating artists were provided with a standard blank deck. These are made of seven-ply maple, and are pressed into a complex form which provides a concave surface and an inclined nose and tail. Instead of a traditional paint job I opted for building out the bottom of the deck with a thick slab of cottonwood bark. 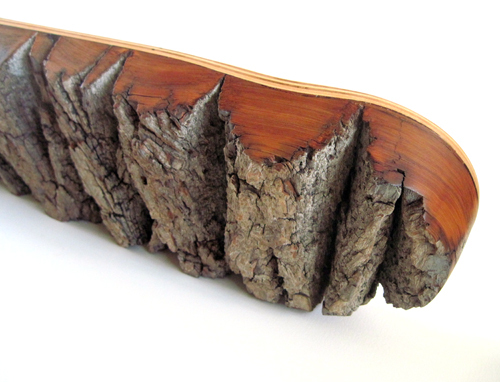 I suppose that I was inspired by the cross-sections of the natural edge bowls that I have been making. 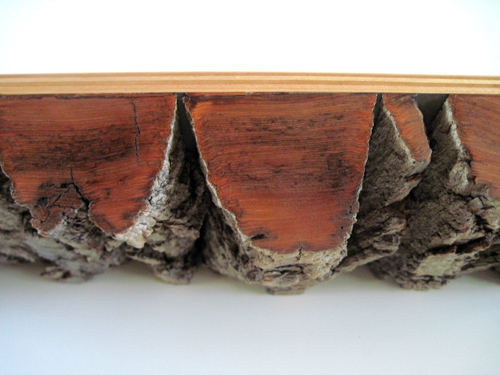 In any case it seemed to be a good use for the bark, which had been hanging around my studio for a few years. 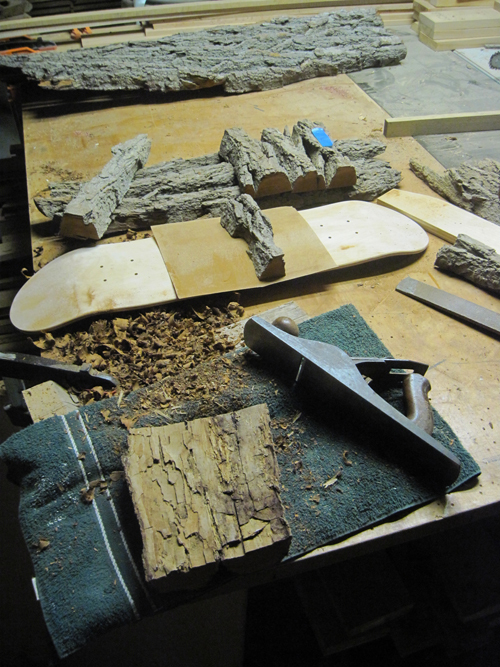 Initial construction involved cutting the bark to rough length and carving it out to match the contours of the board. 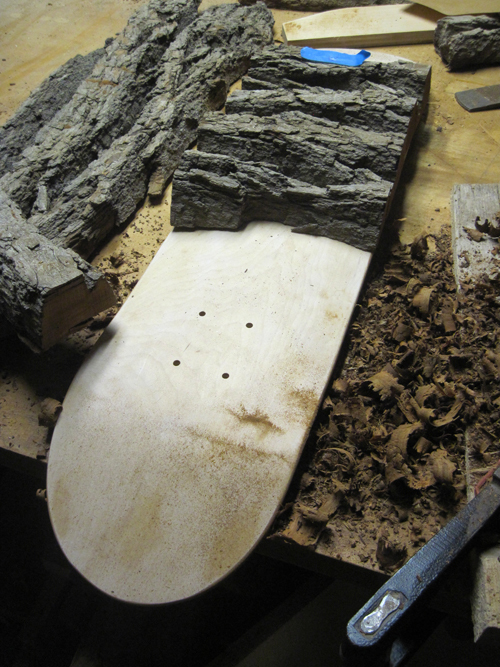 For final fitting in the center I was able to use the deck itself as a sanding block. 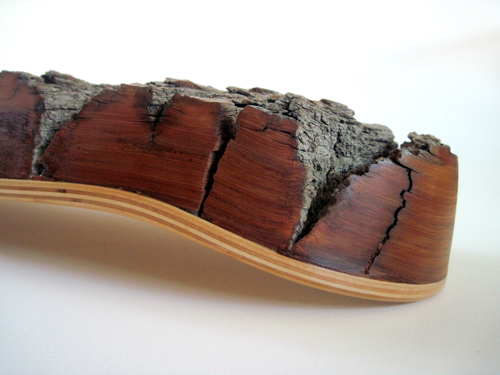 Tail detail showing the natural clefts and striations in the bark. I applied shellac and wax to the cut surfaces, but left the outer (gray) face natural. Bottom view of board, showing the slight taper on the edges. The truck mounting holes have been drilled through the bark, and although I originally thought I might recess a rectangle for each baseplate I later decided that it would be too disruptive. The finished deck. To my eye it has connotations of the thick-soled shoes that became popular among skateboarders in the late 80's. I worked for as seamless a finish as possible in the joinery between the bark and the deck, because I wanted it to appear almost as if it had been peeled straight off of a tree. I removed the manufacturer’s finish from the top of the deck and applied several coats of shellac, sanding to a fine finish. This was then polished with paste wax and rubbed out to a silky smoothness. 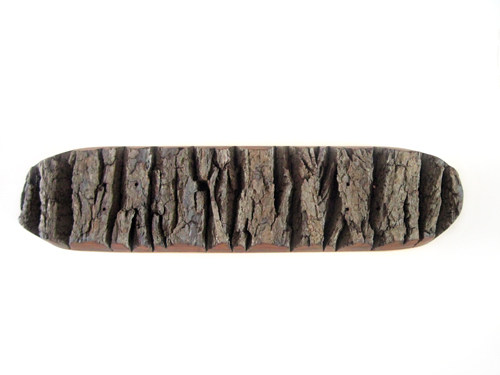 The overblown textural contrast between the top and bottom of the board is meaningful to me in that it represents my own experience of skateboarding, friction and coarseness are interwoven with smoothness and speed. 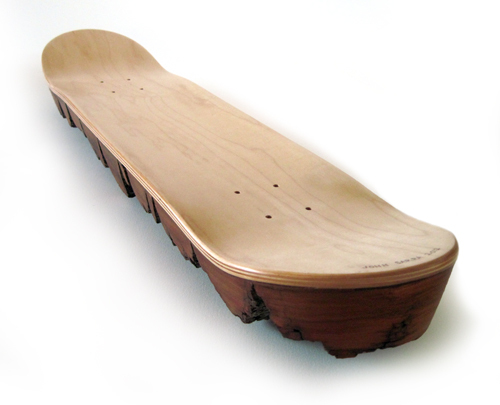 This entry was posted in events, space and surface works, Uncategorized and tagged blank deck, cottonwood bark, custom deck, custom skateboard, Get Up Gallery, LV SK8 Six, natural edge, seven ply maple, shellac, skateboard, wax on June 25, 2012 by johnsarra.